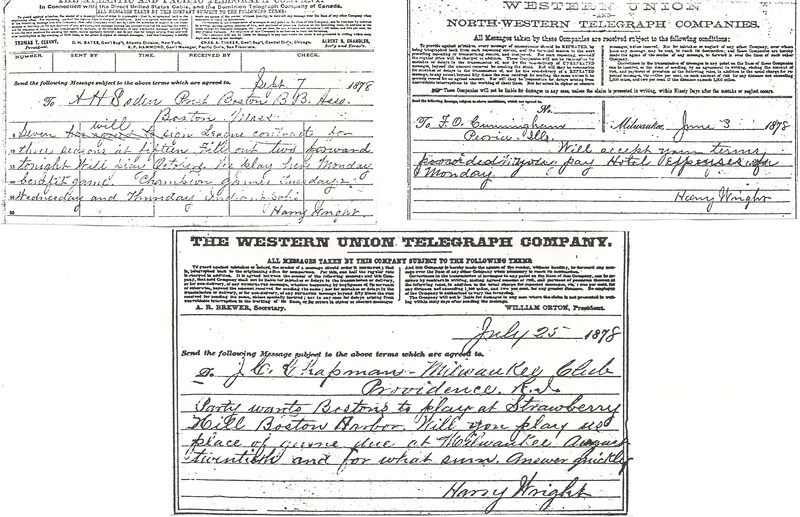 JSA authenticated this telegram written by a telegraph operator as a genuine autograph of HOFer Harry Wright. 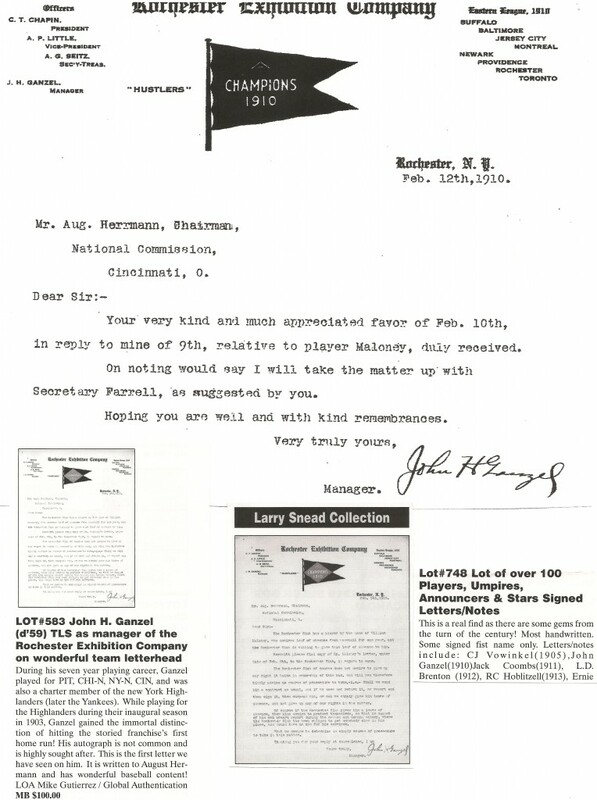 -JSA, James Spence Authentication, recently authenticated a telegram sent by Harry Wright to player Bob Allen in 1891. JSA said it bore an authentic signature of Phillies manager Harry Wright. But the handwriting doesn’t even remotely match Wright’s, and the telegram was clearly documented as the one player Bob Allen was delivered on the receiving end. 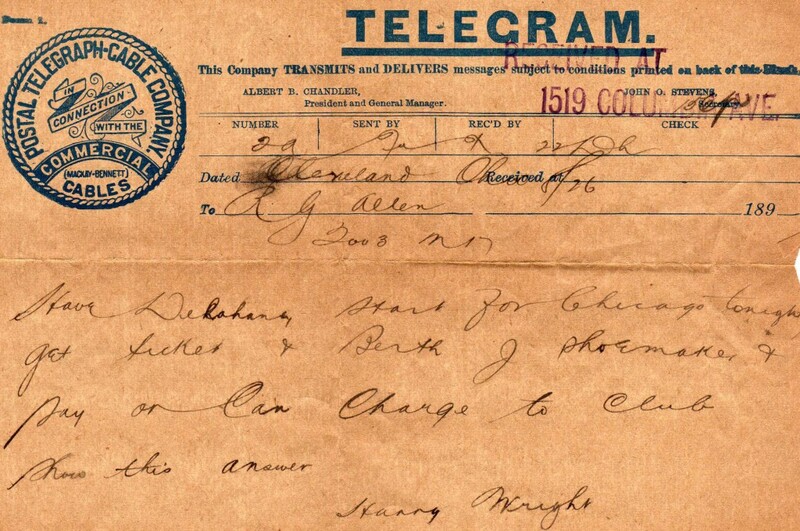 It was written by a telegraph operator in Cleveland and put in an envelope (which also was presented to JSA with the telegram) for delivery to Allen. How can collectors be confident JSA can authenticate Mickey Mantle and Cal Ripken signatures, when they drop the ball on an item like this? Answer: Yes, telegrams written by Harry Wright do exist and they are the actual original copies he walked into or delivered to the telegraph offices on his end in the transmission. Examples of these handwritten Wright telegrams are found in the New York Public Library’s Vol. 2 scrapbook of the Harry Wright Correspondence Collection. Of course, volumes 1, 3 and 4 were stolen from the NYPL in the 1970s along with many other telegram drafts that Wright executed in his own hand. If collectors have any similar Harry Wright telegrams in their collection, they should contact the New York office of the FBI at: ny1@ic.fbi.gov . These three telegrams executed in the hand of Harry Wright in 1878 are presently found in the Wright Correspondence Scrabook Vol. 2, at the New York Public Library. Wright telegrams similar to these in private collections are items that were once housed in the three volumes stolen from the famous Spalding Collection in the 1970s. This 1884 telegram written by Harry Wright was stolen from the NYPL's Harry Wright Correspondence Collection's scrapbook, Vol.3. This Feb. 12, 1910 letter from John Ganzel to August Herrmann is part of the HOF's "Herrmann Papers" archive. Another Ganzel letter to Herrmann, dated Feb. 9, 1910, was sold twice at auction (inset) by Mike Gutierrez in 2003 and 2004. -Babe Ruth forgeries are everywhere…..Sports Collectors Daily just advertised an embarassingly fake Ruth signature on a “2010 Topps Tribute” card, and alleges it features authentic signatures of the 1927 Yankees. 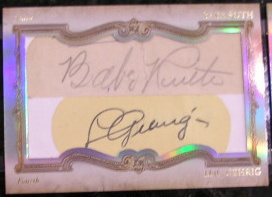 Here’s the article: http://www.sportscollectorsdaily.com/1927-yankees-topps-tribute-card-pulled-consigned/ Billed as a “1-1 Legendary Lineups autograph book card,” the Topps product features horrible forgeries of both Ruth and Gehrig. Who authenticated this one? The experts we spoke to deemed them poorly executed forgeries. The card is being offered on EBAY by Beckett Select Auctions with a minimum bid of $20,000. These two horrible Ruth and Gehrig forgeries are featured in Topps' "Legendary Lineup Autograph Book" card. The card is being offered on EBAY by Beckett Select Auctions. -In the New Year, Hauls of Shame will also examine the many Babe Ruth forgeries sold in Sotheby’s Halper Collection Auction. -We hear that collectors should keep their eyes peeled for a large group of Tomlinson Detroit player cabinets that were stolen from the NYPL’s Spalding Collection. We will examine this story closer in the near future. 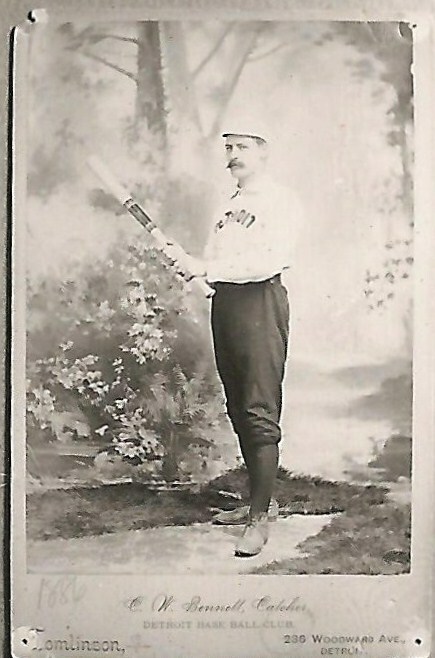 This Tomlinson cabinet photo of Charlie Bennett was stolen from the NYPL's Spalding Collection. It was never listed on the NYPL "Missing List" created in 1987. Collectors who know of its whereabouts should contact the FBI's NY office. - Hauls of Shame will usher in 2011 with the unveiling of an exclusive report featuring the “Halper HOT 100 List.” The list features the top 100 stolen items that were once part of the Barry Halper Collection. UPDATE (Dec. 27, 2010): Although the Beckett Select Ebay auction was terminated early for the 1927 Yankee “Topps Tribute Card,” neither Topps nor Beckett returned phone calls inquiring who authenticated the Ruth and Gehrig signatures. The video featuring the card, once featured on the Beckett site, is also inaccessible. UPDATE (Dec. 29, 2010): Beckett disclosed that the 1927 Yankee “Topps Tribute” card was pulled from the EBAY auction because of the questions about the authenticity of the signatures featured on the card. They also confirmed that PSA/DNA authenticated the item and that they still stand behind their opinion that all of the signatures are genuine. Beckett is reported to be consulting with James Spence Authentication (JSA) for an additional opinion on the item. That’s the same James Spence who authenticated a telegram written by a telegraph operator, as an authentic Harry Wright signature- That’s the same telegram still being offered for sale with a fraudulent JSA LOA at Clean Sweep Auctions. The auction on EBAY for the “Topps Legendary Lineups Babe Ruth Lou Gehrig etc…” (featured in this story) was terminated today, with no bids. The auction was supposed to end on Dec. 23rd. Hmm. Is that Happy Chandler’s name on the top of the Wright telegram? I smell a conspiracy ormy name is not Pickles.